“Extra Content” of this episode to be uploaded in a couple days. Extra Content uploaded. 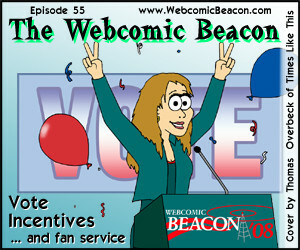 Go to the Talk Shoe page at http://www.webcomicbeacon.com/live and look for “#55 Extra Content”. To be clear, I actually like Menage a 3. It’s a fun, shameless, pandering comic. Not really much of a story is presented in-comic. But that does not make it any less fun to follow. There is also a “Part 2” of this show that will be released as Episode 57, since Mike, Eric, and Stef stuck around for over 40 minutes after the recording.